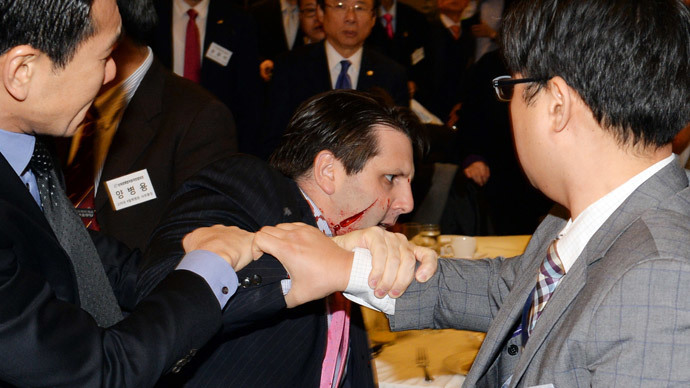 North Korea has said the razor attack on the US ambassador to South Korea, Mark Lippert, was “just punishment” for the two countries’ joint military drills. The assault has left the US official’s face slashed, but he is now recovering. The ambassador has since tweeted of the news. Lippert was at a breakfast forum earlier in central Seoul when the attack occurred. During the attack, Lippert was slashed in the face by an unidentified man, a witness told Reuters. Other outlets are reporting that the assailant used a razor. "The guy comes in wearing traditional Korean brown and tan dress. He yells something, goes up to the ambassador and slashes him in the face," Michael Lammbrau of the Arirang Institute think tank, who witnessed the attack, said to Reuters. "People wrestled the guy to the ground, the ambassador was still in his chair. The ambassador fought him from his seat. He was escorted out afterwards. There was a trail of blood behind him. He had about a seven inch-long gash on the right side of his face," he added. Since the attack occurred, video has surfaced online that allegedly shows officials taking the suspect to the ground. Images posted online show the ambassador with blood splattered on his hands and clothing as he clutches the right side of his face. He has been hospitalized and White House officials said the injuries are not life-threatening. President Barack Obama has also called Lippert to wish him a speedy recovery, the White House added. "We strongly condemn this act of violence," State Department spokeswoman Marie Harf said. Meanwhile, South Korean President Park Geun-hye called the incident an "attack on the South Korea-US alliance." The man responsible for the attack was arrested and has been identified as a 55-year-old Kim Ki-jong, Reuters reported. Notably, this isn't the first time Kim has attacked a foreign diplomat, as he was jailed in 2010 for throwing a piece of concrete at a Japanese ambassador. Cho also tweeted that the attacker said "Both Koreas need to be united," while AP reported that this statement was made during the attack. Meanwhile, other outlets are reporting that the man yelled, "No drills for war," referencing joint military drills conducted by the US and South Korea. North Korea has also come out with comments, its news agency KCNA reporting that the attack was a "just punishment." “The US has been in South Korea since 1950. Many progressive activists [there] feel that the US military presence – tens of thousands of troops – a half a century later is not to protect South Korea from North Korean aggression, but to exercise dominance over South Korea’s political establishment and to maintain US military bases in this very important part of Asia,” according to Brian Becker, director of the Answer Coalition, speaking to RT. “The US policy of invading countries and occupying countries increases tension; it increases the cycle of violence,” he continues.